In April, EDC partnered with Cleantech San Diego on two events focused on topics including sustainability, climate action, electric and autonomous vehicles and more. Link2 Clean Transportation and Link2 Cleantech were both held on local community college campuses, hosting 250 students. The panel discussions and networking sessions featured representatives from SANDAG, SDG&E, ChargePoint, Green Charge, Lumeo and Mossy Toyota. In May, EDC partnered with the UC San Diego Design Lab to host Link2 Game Design – an event focused on the growing alternate and virtual reality industry. The panel discussion featured game design experts from Daybreak Games, Tsunami VR, ThoughtSTEM, Jam City and VAVi Sport & Social Club. After the panel, more than 100 students participated in hands-on virtual reality demos and networked with industry representatives during the three-hour event at UC San Diego. This week, World Trade Center San Diego spent a whirlwind few days in Tokyo celebrating the launch of a UC San Diego office and workspace in the heart of the life sciences hub in downtown Tokyo, Japan. The workspace will promote collaborations between UC San Diego researchers – and the larger San Diego business ecosystem – and research, education and industry partners in Japan. Located in the region’s largest trade and investment market, the facility represents how San Diego continues to lead with its research and innovation in building global connectivity and competitiveness. As a collaboration between the UC San Diego Jacobs School of Engineering and the UC San Diego Office of Research Affairs, the Tokyo facility will serve as a home base for university faculty whose research brings them to Japan and as a venue for research symposia, networking events and alumni functions. As is always the case in San Diego, the opening was founded in regional collaboration. I was proud to celebrate the opening alongside Sandra Brown, UC San Diego vice chancellor for research, dean of UC San Diego Jacobs School of Engineering Al Pisano and Robert Sullivan, dean of UC San Diego’s Rady School of Management. It was also a wonderful opportunity to meet so many UC San Diego alumni, who are now in positions of influence throughout Japan’s major industries, and all are eager to build bridges back to San Diego. “We are very pleased the office is located at the heart of the life sciences hub in Tokyo, a perfect fit for UC San Diego as our two cities are seen as world leaders in life sciences and biotechnology,” said Sandra Brown, UC San Diego Vice Chancellor for Research. A big thank you to Rough Draft Brewing, one of this year’s MetroConnect companies, who provided some of San Diego’s finest craft beer for giveaway at the event. That’s the San Diego story: world-class research and innovation, paired with first-class enjoyment. For more information, visit UC San Diego’s news release. Greetings from Tokyo, Japan. This week, behind a newly relaunched World Trade Center San Diego, EDC kicks off its 2016 international program. Our goals are clear – grow exports and position the region as a choice location for investment and science and technology partnerships. I am here in Tokyo the next few days with the Jacobs School of Engineering at UC San Diego. From day one, we were met with great enthusiasm for expanded partnerships with the University of Tokyo, University of Osaka, and private industry leaders such as Mitsui, Honda and the Japan Venture Capital Association, to name a few. 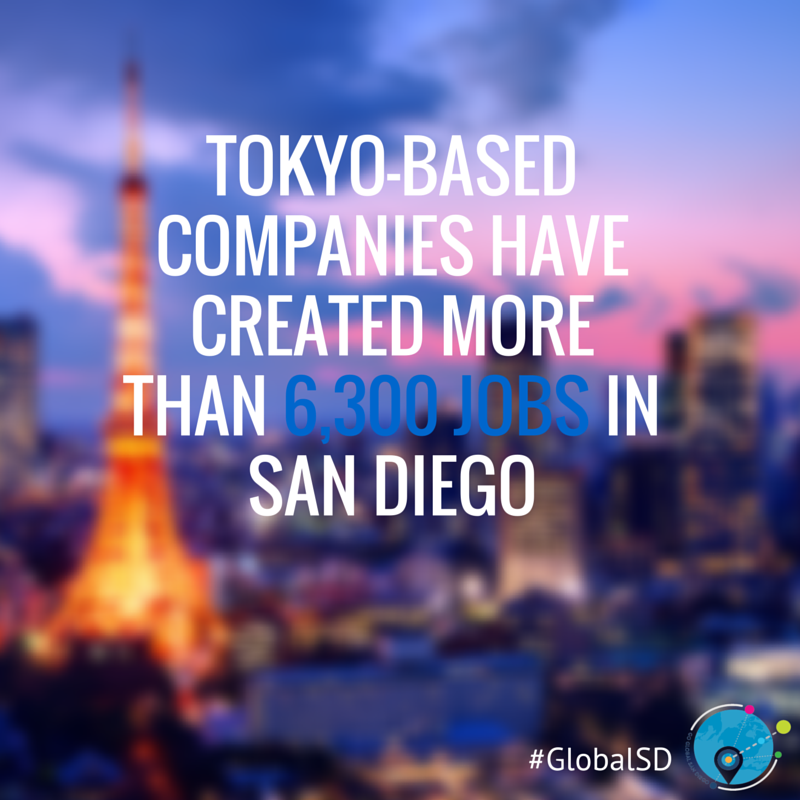 Japan represents San Diego's largest trade and investment market, making the relationship key to our economic growth. Tokyo alone accounts for nearly 25 percent of all foreign owned establishments in the region. With operations in San Diego, Japanese companies such as Kyocera International, Sony, Ajinomoto, and Takeda are some of the most active and community-minded companies, employing hundreds of San Diegans. Japan leads the way as an export market, consistently ranking among the top five most important markets for San Diego. From water technology, to microelectronics, to tourism, to telecommunications to renewable energy and craft beer, Japan punches way above its weight in the consumption of San Diego products and services. The relationship, however, is not one-sided. A number of organizations in San Diego have long recognized the importance of Japan to our economy, with some committing to a fulltime presence abroad, including Biocom, the San Diego Tourism Authority, the San Diego International Airport, the Port of San Diego, SDSU and of course, UC San Diego. We are looking to build on, amplify and support their work to advance the region's trade interests. Leading with our universities and science and engineering talent, San Diego is successfully attracting attention to our global innovation economy. In partnership with Al Pisano, Dean of the Jacobs School of Engineering at UC San Diego, EDC co-hosted a symposium this week for more than 30 Japanese investors. As investors traveled from Osaka, Kyoto, and throughout Tokyo to attend, it was evident that San Diego’s technology and engineering prowess has garnered global attention, with many inquiring about the region’s business climate and international presence. The global outreach continues next week, through the end of April, and beyond. Next stop: Tokyo (return visit), Nagoya, Osaka, Auckland, Sydney, London, Toulon and Stockholm. We will certainly keep you updated from the road.